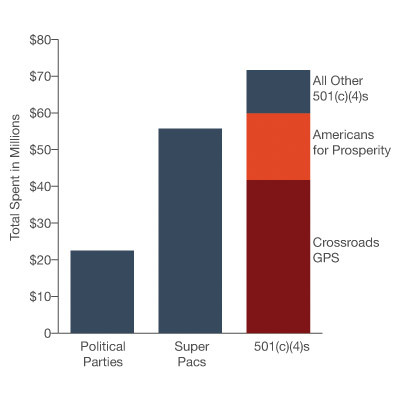 Karl Rove's Crossroads GPS and Americans for Prosperity, a group backed by the Koch brothers, have put almost $60 million so far into ads to influence the presidential race, an analysis of new spending estimates shows. Aug. 14: This post has been updated. These nonprofits, also known as 501(c)(4)s or c4s for their section of the tax code, don't have to disclose their donors to the public. The two nonprofits had outspent each of the other types of outside spending groups in this election cycle, including political parties, unions, trade associations and political action committees, a ProPublica analysis of data provided by Kantar Media's Campaign Media Analysis Group, or CMAG, found. "First of all, it shows how much desire there is for secrecy among huge donors who want to be able to spend money to influence this election without leaving any fingerprints," said Fred Wertheimer, who runs Democracy 21, a watchdog group. "Secondly, it shows that so far, there is an enormous advantage being played in this election by just two groups that are exercising undue influence in the elections." In an email, Jonathan Collegio, a spokesman for Crossroads GPS, defended the group's work. Wertheimer's concern reflected partisan bias, he charged. "Liberal partisans are attacking conservative nonprofits for doing the same things that environmentalist groups, anti war groups, and labor groups have been doing for years without a single complaint," Collegio wrote. ProPublica's analysis of CMAG data is part of an ongoing investigation looking at the growing influence of 501(c)(4) groups on the 2012 election. 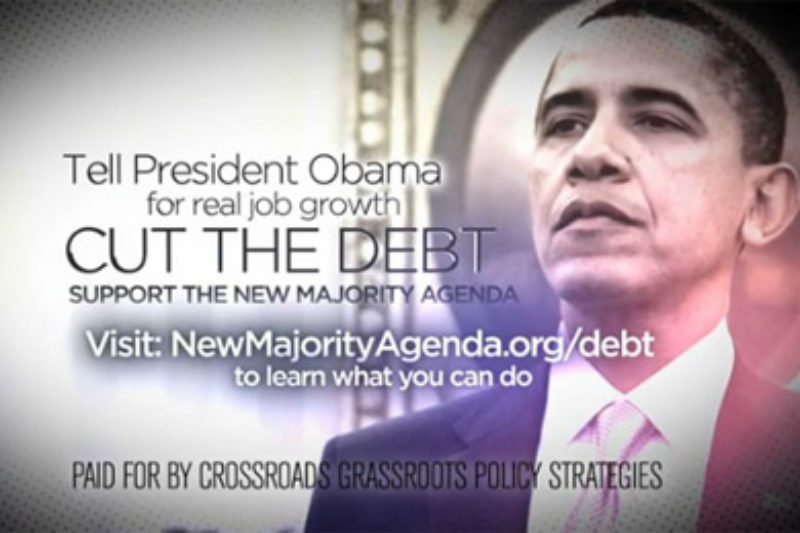 The data reflects spending on ads mentioning a candidate for president this election cycle, including President Barack Obama, his Republican challenger Mitt Romney and former candidates such as Newt Gingrich. Most c4 groups didn't start spending until after the Republican primaries, however. CMAG develops its estimates based on regular surveys of TV stations of what they charge, plus discussions with media buyers about what they're paying. The analysis for ProPublica includes data through Aug. 8. Its totals differ from actual spending reported to the Federal Election Commission in several ways. CMAG's numbers reflect expenditures on broadcast TV ads, but not on ads aired on local cable or radio. They also exclude robo-calls and mailers that some groups must report to election officials. In some cases, however, CMAG's estimates include TV ads that social-welfare nonprofits do not have to report to the FEC because of their content or the time frame in which they ran. After the Supreme Court's Citizens United decision in January 2010, which paved the way for unlimited corporate and union spending on federal elections, many predicted that super PACs would become the biggest vehicle for outside spending. Hundreds of super PACs soon sprang up, some of which paired up with c4s. But it's the sidekicks, the c4s, that have proved more muscular. Rove's super PAC, American Crossroads, has spent an estimated $6.6 million on broadcast TV ads mentioning a candidate for president, CMAG data shows. Crossroads GPS has spent more than six times as much. To be notified about ProPublica stories on dark money, follow us on Twitter, Facebook, or sign up for our email.